July 26, 2013 by Ecommerce News. About Cross-border with tags Germany, The United Kingdom. 2818 views. Shopping online across national borders is getting more and more popular amongst internet users. The United States, Hong, Kong, Canada, Australia, China and Germany will see a combined total of $105 billion in cross-border online shopping this year and in the next five years it should almost triple to $307 billion. According to a new Nielsen research (commissioned by PayPal) called ‘Modern Spice Routes‘, these six countries are the most popular overseas online shopping destinations. A little more than one in three cross-border shoppers across the six surveyed markets purchased from the United Kingdom in the past twelve months. One in seven shoppers purchased something from Germany last year. Especially products like clothes, shoes, health & beauty products and personal electronics are very popular items to purchase online via an overseas country. If we look further into the two European countries from this research, we’ll see and notice that The United Kingdom has 15.9 million online cross-border shoppers, who will spend 13 billion dollars in 2013, with up to 18.5 million online cross-border shoppers expected to purchase online for more than 27 billion dollars by 2018. Germany has 14.1 million online cross-border shoppers and they’ll spend 10 billion dollars this year, with up to 15.8 million online cross-border shoppers who are expected to spend up to 14.6 billion dollars a year by 2018. One in five British online cross-border shoppers shop in Germany, while almost half of the German respondents shop in the UK. 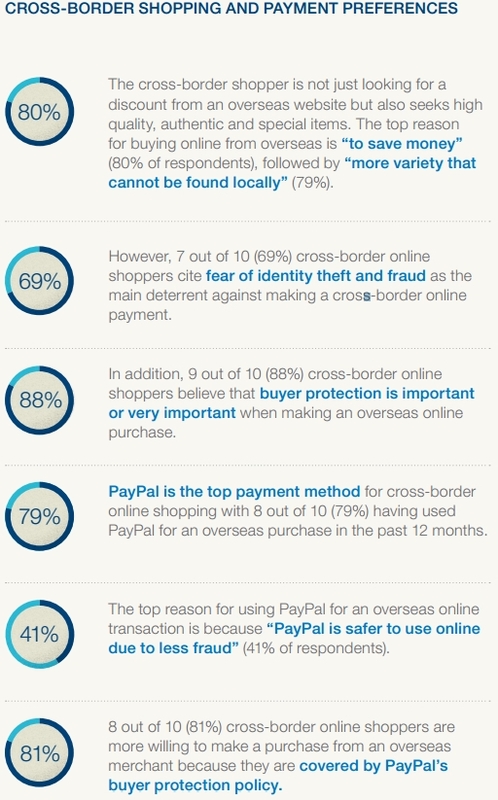 The main reason for buying online from overseas is ‘to save money’ (said by 80% of the respondents), followed by ‘more variety that cannot be found locally’ (said by 79%).